From the observation of the starry sphere we can make simple observations that are the origin of the astronomical views of the ancients which still determine to a large extent the way in which common sense and ordinary language relate to celestial phenomena. One of the first distinctions made in antiquity is that between wandering stars (the Sun, the Moon and the planets of the solar system) and the stars defined as “not wandering” (fixed stars) since for their distance from the earth they seemed still to observation with the naked eye. 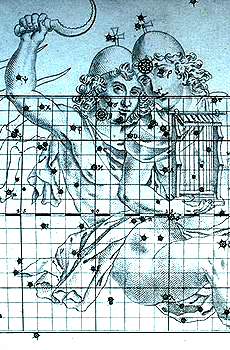 Since very far-off times, the fixed stars were considered as images, starry figures, asterisms, that is star clusters. They formed a fascinating representation of characters and mythological figures that was handed down, with variations in the names and references to certain myths, in the main great civilizations developed in every part of the Earth, from Mesopotamia to China, India, Greece within the Arab and Byzantine culture, in the Latin West, in Northern cultures, and so on. 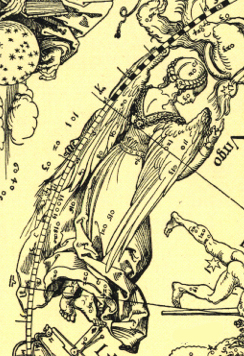 We find many references of a classification of the main images or constellations in literary works. 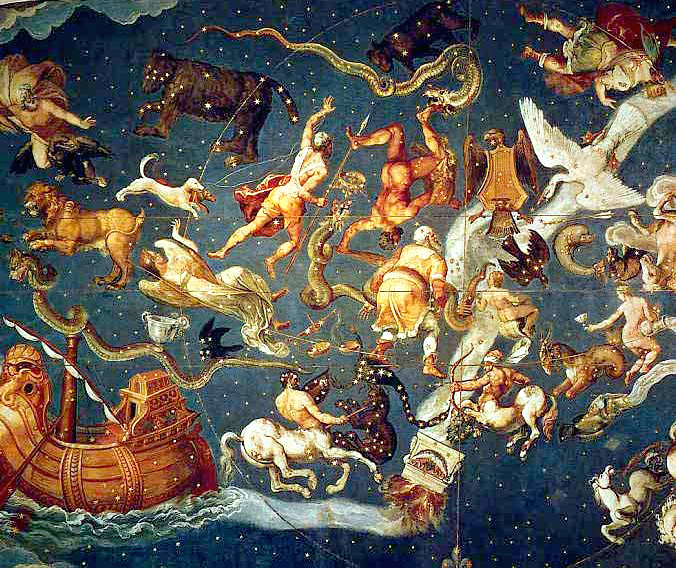 The Greeks, around the fourth-fifth century BC, considered 48 constellations and 11 zodiacal constellations (placed on the ecliptic). Ptolemy speaks on them extensively in the twelfth chapter of the first book of the Tetrabiblos. Only around the second century B.C. 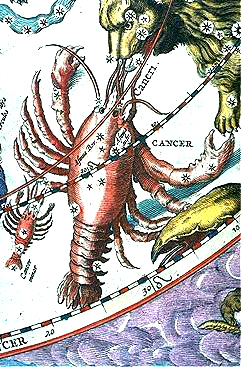 those that originally were the stars of the claws of the Scorpio became the zodiacal constellation of Libra. In the first century BC, Terentius Varro and Firmicus Maternus mentioned a classification of the “barbaric sphere”, which refers to earlier works dating back to the Babylonian uranography of the third millennium before Christ. The treatment is a mitogenesis, an explanation of the birth of the constellations and it contains a detailed division of the features of the single stars. Compared with the description given by these authors we find some differences in later works such as “Il cratere della Sapienza” by Croce and the “Liber Hermetis” by Guido Pellegrino. Besides the many works of authors of the past, in recent times we indicate an interesting work, just published, on the origins of the Chaldean astrological observations: “la Scrittura Celeste – the birth of astrology in Mesopotamia” by Giovanni Pettinato, published by Mondadori. It is essential, useful and enlightening the recently published book “Le dimore celesti, Segni e simboli dello zodiaco” by Giuseppe Bezza, Xenia editions, which also speaks about the origin of the zodiac and the superimposition, which already existed in the past – but that in the current era, in the commonly widespread knowledge, has created distortions in the original foundation and the interpretative value – of the meaning of the zodiacal sign and the zodiacal constellation or starry image near the ecliptic. Concerning this we have to ask ourselves some questions. What are the twelve signs of zodiac that today we interpret greatly and which is the role of the stars that, in their groups, we recognize in the night sky in the form of animals, of human figures? Is there also a distinction with regard to the interpretation of the signs of the zodiac belt and constellations? “The first stargazers gave to various groups of stars those names that their imagination suggested spontaneously and therefore most of the constellations must have had, at least originally, a descriptive name, which, often, was moved by the needs of the cultivation. Many images had, in this way, a descriptive name, so that we can say that they are naturally given. The proof is that similar descriptions were attributed to different constellations by primitive peoples without contact among them. Later on the myths came and weather considerations, based on the observation of individual stars or asterisms at their rising or setting, were added. A complete uranography, rich in nomenclature and description, is found in developed societies, such as China and Mesopotamia. From Mesopotamia, then, it spread throughout the Middle East and in Greece “(Giuseppe Bezza, Le Dimore celesti, p. 3). “The zodiac originates as a belt woven of groups of stars. In the Greek uranography consisting of 48 constellations, this belt includes the stars of Aries, Taurus, Orion, Cancer, Leo, Virgo, Corvus, Scorpio, Ophiuchus, Sagittarius, Capricorn, Aquarius, Pisces, Cetus. Excluding the stars of Orion, Corvus, Ophiuchus and Cetus, which are only partially included in the belt, there are eleven asterisms. However already in Babylon the claws of Scorpio constituted an independent image, called in Akkadian zibanitum, Libra, or better, the pans of the balance, perhaps because its two major stars (α and β Librae) rise almost simultaneously, suggesting an idea of balance. 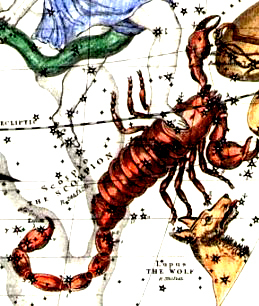 In Greece initially these stars formed the claws (chelai) of Scorpio or the scale pans (zygoi) and only secondly, with Hipparchus in the second century B.C. we have the singular form Zygos, Libra. Therefore there are twelve constellations in the Zodiac belt, which are similar in number and name to the twelve sections of 30 degrees. These constellations, as images painted in the sky (zodia), have determined and unchangeable shape and size. Likewise each of the twelve parts of the zodiac mathematically determined is fixed and unalterable: if we consider the image of Aries, the first star is always the eastern one on the horns, the last star is the extreme one on the tail, while considering the first part of the mathematical zodiac, the beginning is always the vernal equinox, the end is the twentieth degree from it. Then if we imagine two zodiacs, the first one starry or sidereal, the other one mathematical or tropical, we must consider them both fixed and permanent as for the portions that compose them. Now, first of all, we deal with the second zodiac. This is a great circle of the celestial sphere that intersects the equator at two opposite points, and for this reason it is divided into two equal parts, of which one tends northward, the other one southward. Along the zodiac, the Sun, the Moon and five planets perceivable to the eye move incessantly, by virtue of their apparent motion. In particular, the apparent motion of the Sun takes place precisely along this circle, without deviation, but describing the midline. This is known as the ecliptic, because when the Moon joins or opposes the Sun lying on this line, it produces an eclipse, that is, the light of one of the two luminaries (Sun and Moon) lacks and fails (ekleipei). As for the Moon and planets, they move in their particular orbits that deviate from the ecliptic now northward, now southward. So they move with a spiral motion intersecting the ecliptic, or moving away up to definite limits and when they pass through the ecliptic they are in their node, that is their greatest elongation in their boreal or austral node. orbits of all the planets” (Le Dimore Celesti, pp. 5 and 6). c. an arc of 30 degrees taken in the celestial sphere, as unit of measure. In front of the ambiguity of the term, Ptolemy in the Almagest, when he illustrates the ascensions of the twelve portions of the mathematical zodiac, he feels compelled to warn the reader: “We will give incorrectly the name of the images (zodia) to the twelfth portions (dodekatèmoria) of the oblique circle”. 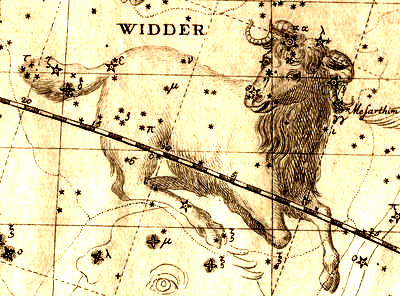 Here Ptolemy does not mean that he accepts the name of zodion to indicate each twelfth portion (dodekatèmorion) of the mathematically defined Zodiac, but he yields to the already common practice of naming “dodecatemori of the zodiac” according to the names of the celestial images, that is to recite Aries as the first, Taurus as the second, Gemini as the third and so on. The semantic versatility of the Greek term Zodion and of the Latin one Signum was maintained throughout the astrological literature and it still remains today. It has given rise to serious errors, against which Valentino Nabod still hurled, at the end of the sixteenth century, in its astronomical institutions. In the course of this treatment, for simplicity, we mean by the term Sign the dodecatemorion of the mathematically defined zodiac, by the term image or constellation the sign as it is composed of stars”. (G. Bezza, Le Dimore Celesti, pp. 315). The constellations are figures of various forms constituted by groups of stars that have each their own features which denote a quality. These qualities can be attributed on the basis of their color, their easy or difficult vision with the naked eye (or in any case with rudimentary tools compared to those of today), and so on. The twelve constellations in the Zodiac belt, placed in proximity to the ecliptic – the starry or sidereal zodiac – are similar in number and name to the twelve sections of 30 degrees of the mathematical or tropical zodiac. The originary coincidence of the constellation, that of the image of the stars of Aries, in the proximity to the spring equinox, with the 30° of the first of the twelve portions of the mathematical or tropical zodiac (which is nothing other than the twelve months subdivision of the solar year) is no longer present. Therefore, we observe the action and the quality of those same stars according to their current position, which, for the shift generated by the phenomenon of the precession of the equinoxes, is shifted by nearly one sign. 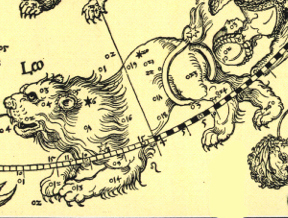 This means that for most of the zodiac sign (dodecatemorion) of Aries, in this portion of the zodiac belt, there are now the stars of the constellation of Pisces, like the zodiac sign of Taurus which contains most of the stars of the constellation of Aries and so on for all the other zodiac signs. – the sea ones: Cancer and Capricorn. In written texts the opinions often do not clarify whether they are referring to the zodiacal constellation or to the immaterial sign of the zodiac. In this case the opinions merge and describe both. For terrestrial constellations Ptolemy does not refer to the earth signs of zodiac, the “beodes”, but to “ifersaia” those who move on the earth. More generally, the constellations are representations of the “human beings”, that move on the earth or not, the “winged creatures”, that does not move on the earth, the “water creatures” (fishes). Among the terrestrial ones, some of them are considered human and the others are not. All those moving on the earth, that are not human, are Leo, Aries, Capricorn, Scorpio. 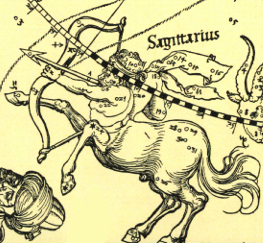 For Sagittarius the first part is human and it means something that happens to men, the second part, the part of the stars describing the beast, the centaur, is terrestrial and it means something that happens to animals. Pisces are aquatic, Aquarius is human, Libra corresponds to its origins, to the stars that made up the claws of the Scorpion. When we speak of “terrestrial images” we mean more commonly the terrestrial constellations except human beings. 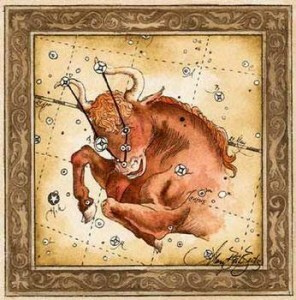 The terrestrial images of quadrupeds, Leo, Aries, Taurus, indicate something that occurs to the corresponding animals: cattle, sheep, pigs and so on. 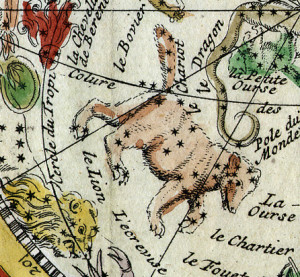 Among the terrestrial constellations there are always constellations in the shape of creeping animals, snakes and the like; the feral constellations of wild animals which are harmful to the human race, such as the Lion and the Wolf. Moreover, there are “the constellations of domestic animals, those useful and meek animals which benefit the fertility of the land, according to the forms of each, such as horses or oxen or sheep, and the like” (Ptolemy, Tetrabiblos). Among the terrestrial constellations the northern ones were primarily associated with phenomena such as sudden earthquakes, the southern ones were linked to flooding, “the unexpected roars of water”. it is represented with wings, and the like. They “produce events affecting flying creatures, especially those that are food for men, in floating creatures, including aquatic animals and fishes. 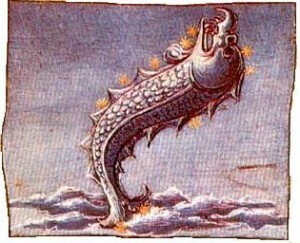 Of the constellations of the sea, such as Cancer, Capricorn and Delphinus, among the sea animals, and also about the navigation in the river constellations, such as Aquarius and Pisces, the rivers and sources, but with regard to both genders, in the constellation of Argo” (Ptolemy, Quadripartitum). The Indian representation of Capricorn is a crocodile emerging from the sea and that has legs and tail that are not of a crocodile. The traditional Greek representation is a goat that in its last part has a large scaly fish tail. The constellation of Pisces is made up of the stars of the two fishes and a group of small stars “the string of fishes” representing a river. Similarly, Aquarium is a river constellation because, the stars of the “waterfall” spill like water and go into the river. crops, but in Egypt, it concerns specifically the growth of the Nile. At the autumnal equinox they concern sowing, fodder and the like. At the winter solstice vegetables and species of birds or fish that abound in that period. In addition, the equinoctial signs appear as a symptom regarding the sacred rites and the worship of gods; the tropical signs to climate change and the change of political customs; the solid signs (fixed signs) to the foundation and construction; the bicorporeal signs (mutable signs) to men and kings”. The equinoctial signs (Aries and Libra) are the centre of the exaltation of the Sun and Saturn, and they are connected to the sacred and to the worship of the gods. The solstitial signs (Cancer and Capricorn) are the centre of the exaltation of Jupiter and Mars, they are related to social customs, laws and public life. parts of Gemini, Apollo and Heracles (also known as Castor, the very brilliant, and Pollux, the bright white), of Cancer the Crib and the Donkeys, of Scorpio the area of the sting (M7), the nebula and Antares, of Aquarius the stars of the water cascade (ψ 1-2-3 Aquarii). Among the constellations also the “nebulae” played an important role, and they only partly correspond to the stars that in the current times are defined astronomically as nebulae. The nebulae are characterized by a difficult visual resolution. As a result in ancient times the consequence was that as well as the star has a veil that covers it and that does not allow a clear view of the same, equally it obscures and removes clarity to the quality of the inherent characteristics. According to this view some nebulous stars and all the Milky Way, where they concerned the physical body, they were considered harmful and meant a sight damage. To this end at the time of birth it was important to observe the possible union among the Moon and some stars such as the Crib – the Crab Nebula – the Pleiades – the stars of Taurus – the bow of Sagittarius, the sting of Scorpio, the parts of the Lion close to the Coma Berenices, the Urn of Aquarius. In a general sense, it was believed that the Milky Way, on the degree of the ascendant, could indicate a “perturbation” of the soul of the individual and contribute to the conditions that were observed for visual disturbances. 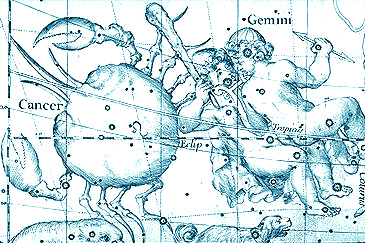 Among the parts of the sky where the Milky Way intersects the ecliptic there are the degrees from 22° of Gemini to 4° of Cancer; from 15° to 22° of Sagittarius; from 5° to 8° of Capricorn. Instead the great stars, the bright stars known as the heart of the constellation were related to heart disease. In particular, among the more important stars we have the heart of the constellation Taurus, the star Aldebaran (the eye of Taurus); the constellation Leo, the star Regulus (the heart of the Lion); and, in the constellation Scorpius, the star Antares (the heart of the Scorpio). 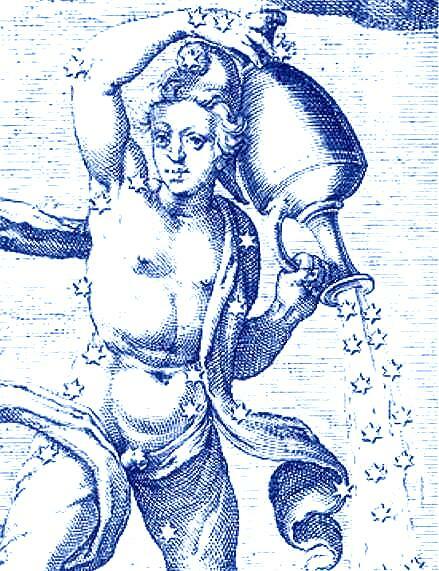 In several works the stars Azemena are mentioned and they are considered dangerous to physical health: the group of the Pleiades and Aldebaran, the Crib (Praesepe) and Donkeys (Aselli), Denebola (cauda Leonis), the Coma Berenices (Comae Berenicis), the stars of the forehead of the Scorpio (β, δ, κ), its feet (ν Scorpij) and its sting (M7), the bow of Sagittarius (nebula M8), the eye of Sagittarius (ν1, ν2 Sagittarij), the tail of Capricorn (spina Capricorni: ε – κ), the urn of Aquarius (ψ 1-2-3 Aquarii: the roar of water).